By 2012, Apple’s Mac Pro was getting long in the tooth. It was gigantic and made of old tech. The limitations of the big, old cheese grater case it inherited by the Power Mac G5 were apparent and it kept getting more expensive. Apple did something very odd, they pre-announced they were working on a replacement and in late 2013, they announced the new from the ground up Mac Pro. The new Mac Pro was a marvel of design. It featured a cylindrical design built around a massive heat radiation system. It was the smallest professional workstation ever built. It… well, was massively over engineered in a way that nobody asked for. It featured one CPU slot instead of two, requiring more expensive CPUs. There were only 4 DIMM slots for Ram. Instead of the multiple 3.5” bays, there was a single proprietary SSD similar to the then year old Retina MacBook Pros. It had two video cards and neither were upgradable. Apple bet the farm on Thunderbolt 2 expandability and that professional users were be wowed by the technology of the new machine. They were wrong on both accounts. While the new Mac Pro was and is one of the most visually stunning desktops ever made and an absolute marvel of engineering, it never understood its audience and expected a glut of third party expansion options that never came. As a result, combined with to rocky transition to Final Cut X, many of the video pros to look at other options in the Windows world and even Hackintosh routes. Other than a surprise update this week, the new and improved Mac Pro never got a second chance and was basically the redheaded stepchild of Apple’s lineup. Apple, thankfully, seemingly understands that it went down the wrong path, admitting to Daring Fireball and other invited media outlets that the second generation Mac Pro is not the machine they need. In addition to its expansion woes, it turns out the Mac Pro was basically built thermally for the hardware that it came with. Apple has had issues with newer, hotter processors and graphics chips that have made any further upgrades nearly impossible. So, the corresponding upgrade is its swan song. However, its not the end of the road for the Mac Pro name. 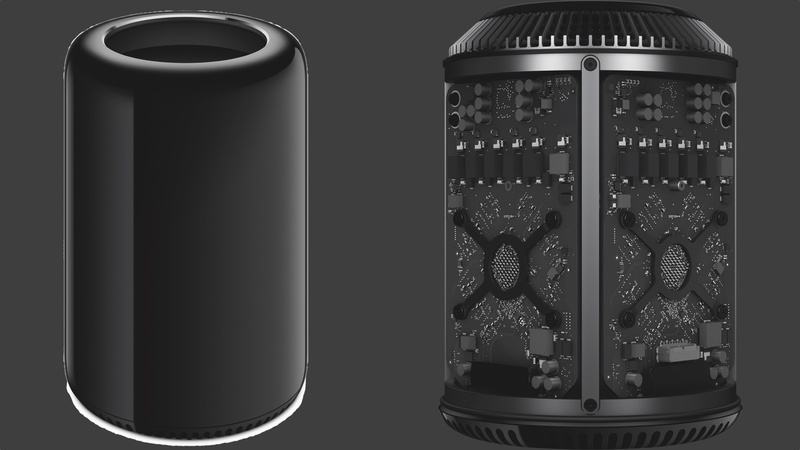 Like with this one, Apple has essentially pre-announced that a third generation Mac Pro is being developed. So, what will this new Mac Pro be? The short answer is we don’t. Phil Schiller used the term “modular”, but that can mean a few different things. Conservatively, it could be another tower like the previous iterations of the Mac Pro and Power Mac line. It would give professionals the expandability they were looking for and I wouldn’t blame them for going to a known quantity. However, that doesn’t quite seem like Apple. When they say modular, I am disposed to take them at their word and am intrigued to see what form that takes, especially when paired with Thunderbolt 3 technology for external storage, PCI-E expansion, or even graphics cards. Apple isn’t only resting its pro ambitions on the Mac Pro. They also gave word of a new generation iMac that would further encroach on the pro space. While the all in one will not fit all the former Mac Pro users, Apple is correct that some could and have already gone that route. Updating with the latest CPUs and I/O will make what is an already capable lineup even more so. And for those wondering, yes Apple still has plans for the Mac Mini as well. This little Apple Q&A is that the demise of Apple’s desktop options are greatly exaggerated. I can’t tell you if the next generation of solutions will match the questions, but we know Apple is at least trying. For a company whose aim is to change the world, not drift with it, mistakes can and will be made. It’s moving forward after those mistakes and learning form them that counts.